"My first year of motherhood I lost prayer. I lost early mornings of quiet, mornings in my pajamas with a Bible in my lap, mornings when I spoke my mind’s chaos into God’s ear and let the chaos come back ordered, holy sealed. I lost peace. I lost clarity and certitude. My faith was never perfect before my son was born, but somewhere in that first year, somewhere in my distraction and exhaustion, I lost the Spirit-life I had known. 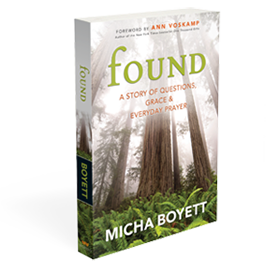 I blamed myself. . . ."
Found is a story of nourishment for anyone who hungers for rich spirituality and has come up empty. It’s a story for anyone who is trying to reconcile great big dreams with the ordinariness of their days. It’s a story of discovering divine kindness and affection in the most mundane moments of life. With brilliant and moving prose, Micha Boyett invites us on a journey to discover the richness in the everyday—and it changes everything. "I read Micha’s words and my breathing slows. She gives perspective. And hope. And a refreshing lightness to not take what doesn’t matter too seriously. She revives: When you order the tangle of your days around Him, He untangles you. She moves: The moments all matter.The daily awareness of the small add up to the whole of your life and her words are like a dawn, stirring you to wake and walk.